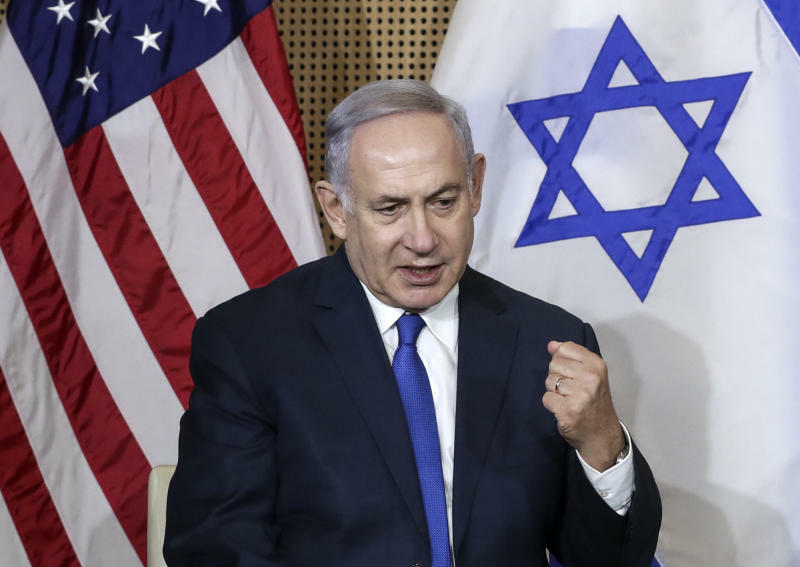 WARSAW, Poland (AP) — Israeli Prime Minister Benjamin Netanyahu was forced to spend an extra night in Warsaw after his plane was damaged following an airport mishap shortly before departure. He departed around noon Friday, marking an inauspicious ending to a turbulent visit. The prime minister and his entire entourage were on-board a chartered El Al plane shortly after midnight, after a two-day visit to a high-profile security conference, when a vehicle towing the aircraft on the runway crashed into it. A photo circulated to traveling journalists showed large scrapes in the underbelly of the aircraft. Netanyahu and his wife were taken off the plane and ushered back to their hotel. Other aides, including Netanyahu's national security adviser and his military secretary, spent the night on the aircraft, saying they did not want to go through the hassle of pre-boarding security checks again. A replacement plane was dispatched from Israel to urgently return the prime minster before the beginning of the Jewish Sabbath at sundown. Piotr Rudzki, a spokesman for Warsaw Chopin Airport, told The Associated Press the incident occurred as the chartered Boeing 777 was being pushed back from its parking stand by a pushback vehicle. There was damage to the plane's front landing gear and lower fuselage, he said. Poland's state commission for aviation opened a probe. Netanyahu's government has been trying to purchase an official plane for the prime minister to use. It capped a tumultuous visit for Netanyahu, who was in Poland for a U.S.-sponsored security conference attended by several high-profile Arab officials from Gulf countries. Netanyahu had hoped to use the gathering to showcase his budding ties with the Gulf Arabs. But a verbal gaffe and a video leaked by his office threatened to overshadow the event. On the eve of the meeting, Netanyahu appeared to call on other participants to prepare for "war with Iran." His office later said he had been mistranslated and only called on other countries to "combat" Iranian influence in the region. Late Thursday, his office briefly leaked a video showing Bahrain's foreign minister, and representatives of Saudi Arabia and the United Arab Emirates playing down the Israeli-Palestinian conflict and harshly criticizing Iran. Netanyahu's office said the video's release was a "technical error" and quickly deleted it. Associated Press writer Monika Scislowska in Warsaw contributed to this report.